Snowflakes and Citrus smelled like a fresh and sweet summer fragrance so I was surprised to see it listed as a winter scent on Bath & Body Works website. I’m not complaining, just based off cold sniff, I liked it and could easily burn this scent all year long. When I popped off the lid, there was nary a snowflake in sight – just a sweet and sugary fruity scent instead as it wafted all around me. Made with Orange & Lemon Essential Oils with notes of Sweet Mango. Ah! That’s what I smelled the most – orange and sweet mango. The lemon was very faint but hoping all that lemony goodness bursts through once the candle is burning. You never know. I lit my Snowflakes and Citrus candle in my master bedroom to start out and that’s where it stayed till the very end. The scent stayed pretty true to cold sniff… a sweet orange and mango wafted all through my bedroom and open bathroom. 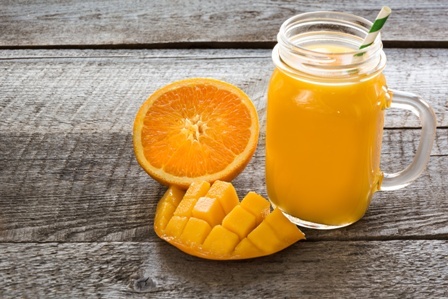 Mango, orange and sugar, in that order. Alas, I never could detect the lemon, if it was there, it was very faint. Strength – Snowflakes and Citrus wasn’t super strong, it filled my bedroom with a soft aroma but never traveled outside my bedroom. To me, that’s a medium scent throw. Rating it, I would give it a 6 out of 10 in a large room. 8 in a medium and 10 in a small. How did my Snowflakes and Citrus candle burn? This candle burned fine. No wick issues. YAY!! Clean burning from start to finish. 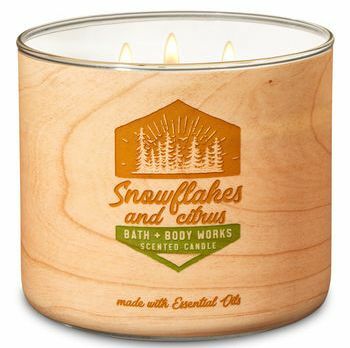 I admit, I have a soft spot for citrus fragrances so I thoroughly enjoyed Snowflakes and Citrus and would absolutely purchase this candle again. It was a perfect blend of sweet mango and orange and a great candle to burn when you simply need a break from heavy bakery or spicy scents. You can also tell essential oils were used in this scent because the strength was pretty subtle. Candles fragranced with essential oils tend to be more subtle. Was I sad lemon never surfaced? For sure, but I still enjoyed this candle. It gave me the fresh little pick up I needed to get back to all my many Pumpkin scents I have yet to burn through. LOL! In closing, I do recommend Snowflakes and Citrus for all you fruity lovers out there. Just stick to a medium or smaller room to burn it in for the best scent throw.